A bombing Wednesday morning killed 3, and 60 bodies were found in various parts of Baghdad the previous 24 hours. Iraqi Prime Minister Nuri al-Maliki and Iranian President Mahmud Ahmadinejad had something of a lovefest at their press conference on Tuesday. Ahmadinejad expressed his complete support for the Iraqi parliament, political process and government. The Iranians always sound just like the Bush administration when they talk about political progress in Iraq. 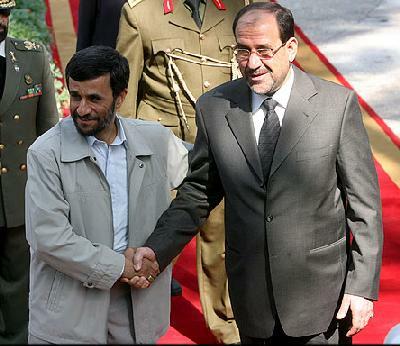 Ahmadinejad also offered help with security affairs. Al-Maliki declined to associate himself with American charges that Iran is fomenting turmoil in Iraq, saying that there were no obstacles to security cooperation between the two countries. Iran and Iraq will cooperate in pumping petroleum from oil fields traversed by their common border, and in its refining. One such project could be online within a year. These fields are far from the Sunni Arab areas, and Iran would help with security, so that they could help the government escape the economic blockade the guerrilla movement has placed on the northern Kirkuk fields, which generally cannot export through Turkey because of pipeline sabotage. AP reports that a member of Maliki’s Da`wa Party in the Iraqi parliament, Haidar al-Obadi, maintain that radical Sunni fundamentalists did infiltrate Iraq via Iran, though he admitted that it was probably without Iranian government knowledge and support. Iran is three times the size of France and its border with Iraq is hundreds of miles long, running through rugged mountainous regions. (It is actually more likely that most radicals coming to Iraq infiltrate from Saudi Arabia, Jordan and Syria. And there aren’t very many such foreign fighters in Iraq anyway, and nor are they the main source of violence.) It is ridiculous to think that Iran is supporting or supplying radical or neo-Baathist Sunnis to blow up Iraqi Shiites, more especially their clients, the Supreme Council for Islamic Revolution in Iraq and its Badr Corps paramilitary, which was trained by the Iranian Revolutionary Guards Corps. AP reports that 24 were killed in civil war violence in Iraq, including bombings in Baghdad and elsewhere and a rash of assassinations. AP also reports an effort in parliament to get a resolution going calling for the withdrawal of US troops. ‘A group of lawmakers tried Tuesday to take advantage of the unpopularity of U.S. troops among many Shiite and Sunni legislators to seek approval of a resolution setting a timetable for the withdrawal of foreign troops _ something the Shiite-dominated government has refused to do. Sponsored by supporters of radical Shiite cleric Muqtada al-Sadr and some Sunni Arabs, the resolution managed to gather 104 signatures in the 275-member parliament before it was effectively shelved by being sent to a committee for review. That committee will need at least six months to examine the resolution and present its findings to parliament. If it were to be approved, such a resolution would be binding on the government. 102 signatures was enough to get the resolution broached if it is reported back out of committee. Typically a good 80 MPs haven’t actually been coming to the sessions, so it is possible that the resolution gained the support of over 50 percent of the members present on the floor. That is, if it had not been sent to committee for review, the resolution could well have just passed on Tuesday. The Iraqi government would be bound by such a majority vote. Apparently the Maliki government has found a parliamentary maneuver allowing it to postpone the resolution for at least 6 months. Reuters has more details on the violence. The Iraqi government estimates that 40,000 internally displaced persons have recnetly returned home to districts such as Kadhimiyah, after 170,000 had been displaced by sectarian violence after the Samarra shrine bombing in late February. There are still districts too dangerous to go back to, such as the Sunni al-Jadidah quarter and the Shiite slum of Sadr City in east Baghdad, to which Sunnis are not moving back. The top Marine commander denies that his forces have lost al-Anbar province. He admits, however, that their mission is not to defeat the insurgency and that all they are doing is “stifling” it. He said that the war would be won politically, when services and goods are provided in sufficient numbers to woo away the Sunni Arabs from the insurgency. The problem with this set of statements is that they don’t contradict the intelligence report that said that al-Anbar had been lost politically. It wasn’t being alleged that the Marines couldn’t go on “stifling” the insurgency. The allegation is that there are no functioning government institutions in the Sunni Arab areas. The allegation is that hearts and minds have been decisively lost. What the American commanders either don’t understand or don’t dare say is that the process of stifling has driven more and more and more Sunni Arabs into opposition to the US presence and the new government. In summer of 2004, when David Petraeus was running Mosul, Ninevah province was relatively quiet. Now there are bombs, killings, trouble. Mosul became a problem with the Fallujah assault, and it has never since stopped being a problem. Samarra is a problem. Tikrit is a problem. Baqubah is a problem. Kirkuk is a problem. Ramadi is a problem. If you just keep a lid on the problems, “stifling” them and driving ever more people into opposition, someday you will wake up and find that you really have lost, and not just politically. The reason, moreover, that the Marines have not “won” is because they cannot. If winning means doing to Ramadi what they did to Fallujah, well that would just drive even more Sunnis to insurgency and further radicalize everyone from Ramadi, wherever they scatter. You could de-urbanize the whole Sunni Arab heartland, but then you’d have large numbers of mobile angry refugees, another Palestinian problem that would last decades and be destabilizing. There is no military solution. Stifling is very bad. If that is all they can do, they should leave. Who cares who the mayor of Ramadi is? And, if they organize to try to overthrow the Maliki government, well, then they can be fought when they begin to march. They would not get very far if the US air force did not want them to. Tom Engelhardt on the real link between 9/11 and Iraq. My reconsideration of the significance of 9/11 for Foreign Policy is reprinted here.